Any walk. Any time. Any place! Check out the 2 minute video below to see what a difference your fundraising can make…why not organise an event now? The Dignity Big Tent Night is a really fun way for the children (and grown-ups!) to connect with overseas mission. A huge well done to our team of walkers who all completed the Yorkshire 3 Peaks, Pen-y-ghent,Whernside and Ingleborough. The walked 24 miles and climbed 1585m around the head of the valley of the River Ribble in the Yorkshire Dales National Park. It was a busy day with many other charities also completing the challenge but a great atmosphere throughout the day. Thank you to everyone who sponsored our team of walkers. Together we raised an incredible £7,106 (incl. estimated Gift Aid)! The Peak District 10 – 10 climbs, 10 miles, 10 hours! This was such a fun day of climbing and walking as our team climbed 10 graded rock climbs and completed a 10 mile circuit on foot and all inside 10 hours. The Peak District scenery was beautiful and the sun shone for the whole day! Special thanks to Will4Adventure who facilitated this event for us…and of course, a big thank you to everyone who sponsored our team of walkers. Together we raised £1,312 (incl. estimated Gift Aid)! That will help us to reach 285 more people with good news of Jesus through a Life Groups, leading to amazing lives and everyday miracles! Dignity Walking Marathon – Suitable for legs of all ages! A huge well done to all 28 walkers who took part in the first ever Dignity Marathon! What a great day we had for our inaugural marathon. By the end of the day there were lots of tired feet and big smiles…along with lots of stories! It was great to support our team of walkers with cookies, flapjacks, balloons, medals and general cheering on! Together the team raised an incredible £5,140 (incl. estimated Gift Aid)! Wow!! Wow! What a weekend we had! 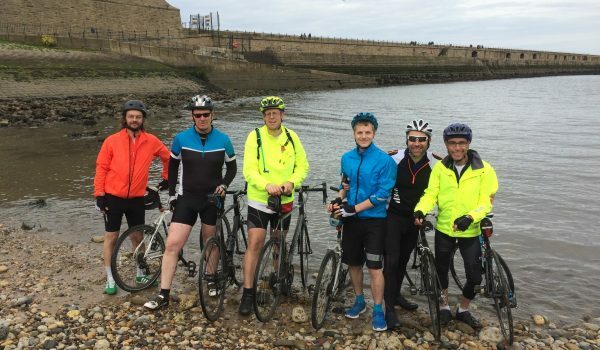 Thanks to our 6 cyclists, Keith, Rob, Paul, Stuart, Ste and Michael who gave it their all to cycle 140 miles from Whitehaven to Tynemouth. They took in the mighty climbs of Whinlatter, Hartside and Parkhead as well as finding their way through Penrith, Keswick, Gateshead and Tynemouth! By doing this they raised an amazing £11,806 (incl. estimated Gift Aid). Legends! Over 2 weekends 11 amazing walkers conquered the Welsh 3000s, the 15 mountains in Snowdonia with summits over 3000 feet. One group completed the challenge in 3 days and the other did the entire route inside 24 hours. Sore feet, achy legs ensued and big smiles followed as everyone was delighted to complete the challenge. In the process they raised £11,041 (plus Gift Aid) – what superstars!!! To mark our 10th birthday our 10×10 Challenge aimed to raise £10,000. Target 1: 300 Life Groups – SMASHED!!! Wow! We’ve just had feedback from our Impact Teams and the number of Life Groups now meeting across rural Zambia and Namibia is 314. That’s an estimated 6,280 people learning more about loving God and loving their neighbour. Amazing! There will be many stories of redemption and hope emerging over the coming year.